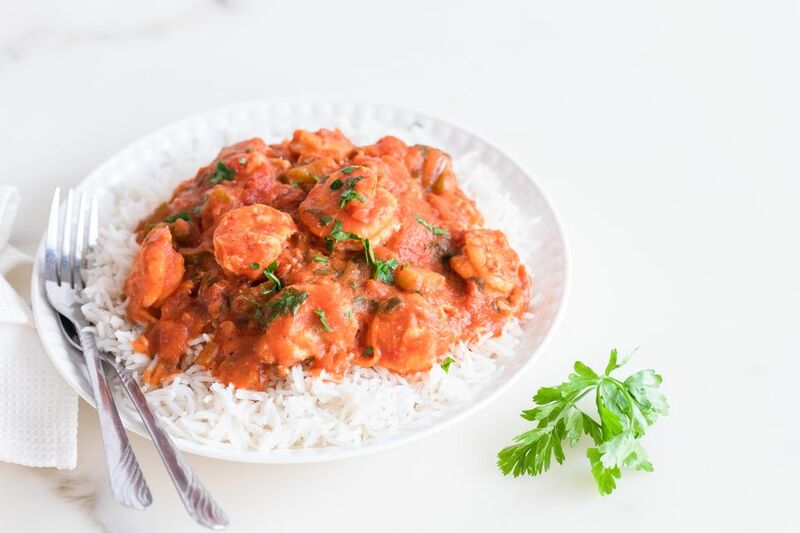 This shrimp Creole is a classic Louisiana dish, made with a tomato-based Creole sauce with the traditional "Holy Trinity" of vegetables: onions, bell peppers, and celery. This Creole sauce is a thickened mixture of tomato sauce, chopped vegetables, garlic, and spices. Add extra hot pepper sauce or cayenne if you like a spicier sauce. As this recipe comes from the Gulf Coast, it traditionally is made with fresh, wild-caught Gulf shrimp. While you can enjoy it with any kind of shrimp, it is best to avoid farm-raised shrimp. Often, the shrimp you see in the refrigerated section of your grocery store are defrosted, previously-frozen shrimp. You'll get a better result if you buy good-quality frozen shrimp and defrost them immediately before cooking. Combine oil and flour in a Dutch oven; cook over medium heat, stirring, until mixture is golden colored. This should take about 15 to 20 minutes. Stir in diced tomatoes, tomato sauce, tomato paste, water, salt, black pepper, red pepper, bay leaves, lemon juice, Worcestershire sauce, and hot sauce, and bring to a boil. Cover and reduce the heat. Simmer for 1 hour, stirring occasionally. Add shrimp and simmer for about 10 minutes more, or until the shrimp are cooked through and turn pink. Do not overcook the shrimp or they will get tough and rubbery. Serve over hot cooked rice and enjoy. The sauce gets better as it has time for the flavors to blend. For a make-ahead tip, make the sauce and then refrigerate it, covered, to use in the next day or two. Or, you can freeze the sauce to use within a couple of months. To finish the dish, bring the sauce up to a simmer and add the shrimp. Use seafood stock or shrimp stock instead of water for a deeper flavor. You can substitute a favorite Creole seasoning blend for the red pepper and black pepper. However, be sure to check the salt content of the seasoning blend and adjust the amount of salt you add accordingly. When peeling and deveining the shrimp, rinse them as little as needed. Too much rinsing will lessen their flavor. If your guests have different preferred spice levels, reduce the amount of red pepper and have hot sauce available on the table so those who like it spicier can take it up a notch. Change it up by adding 1-inch strips of catfish and reducing the amount of shrimp for a seafood creole. Or, you can simply make it a catfish creole, substituting it for all of the shrimp.